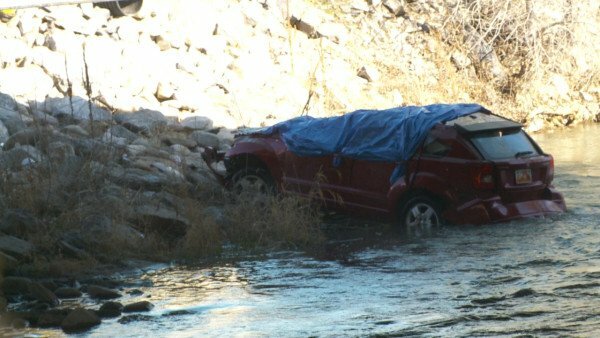 An 18-month-old baby girl has been found alive in a car more than 14 hours after the vehicle plunged into Utah’s Spanish Fork river. The little girl was discovered hanging upside down above water in her car seat by a fisherman on March 7, police said. She was rushed to a hospital in Salt Lake City, where her condition has been upgraded from critical to stable. The girl’s 25-year-old mother, named as Lynn Groesbeck from Springville, was found dead in the driver’s seat. Investigators believe the car fell into the Spanish Fork River after striking a cement barrier at about 22:30 local time on March 6. A fisherman raised the alarm at 12:30 local time on March 7, after he saw the toddler dangling above the water as it flowed through the car. Three police officers and four firefighters who entered the river to rescue the child were later treated in hospital for hypothermia. Police said they would not be releasing any further details unless the baby’s condition changed. The girl’s name was not released.